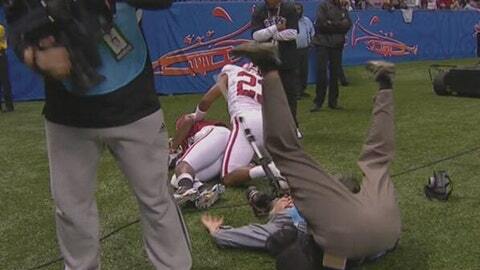 Football is often considered a dangerous sport, but apparently being a sideline photographer can be even more hazardous. During the Sugar Bowl in New Orleans, one photographer got to meet an Oklahoma and Alabama player up close and personal after the two ran out of the end zone on an incomplete pass running the unsuspecting gentleman completely over in the process. Luckily the photographer seemingly comes away from the incident unscathed, laughing off the whole event, but his pricey camera equipment might not have been so fortunate. Hopefully he at least got a good action photo out of it. At least the photographer didn’t get it as bad at this fan who got gut-checked by a South Carolina wide receiver during Wednesday’s Capital One Bowl.